HPA6 is a universal, multi-purpose mixer and headphoneamplifier for rehearsal, studio, or stage. 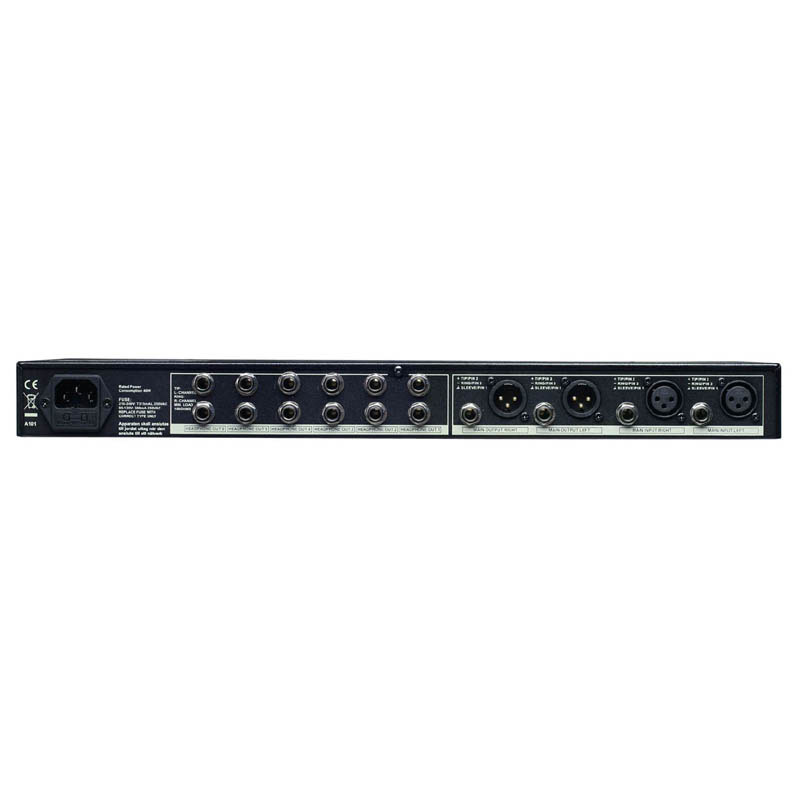 Perfect for headphones, in-earmonitors, or personal monitor mixing, HPA6 features six independent high-powerstereo amplifiers in one compact rack unit that delivers maximum audio quality,even at very high or very low volume levels; HPA6 has a minimized circuitrypath which means there's less "stuff" for your signal to passthrough, keeping your sound clear and crisp. On the rear panel you'll find two additional 1/4"outputs per channel, so you have the capability to send six different mixes toup to 18 sets of headphones or monitors for powerful, precise listening. Therear panel also features stereo inputs and outputs so you can connect severalHPA6 units together for even greater capacity. HPA6's front panel gives you a 1/4" headphone jack perchannel, each with level and balance controls. Its main section provides adetailed, eight-segment LED meter, a master level knob, and a 1/4"Direct-in which gives you the flexibility to mix in an additional sourceon-the-spot with all channels. 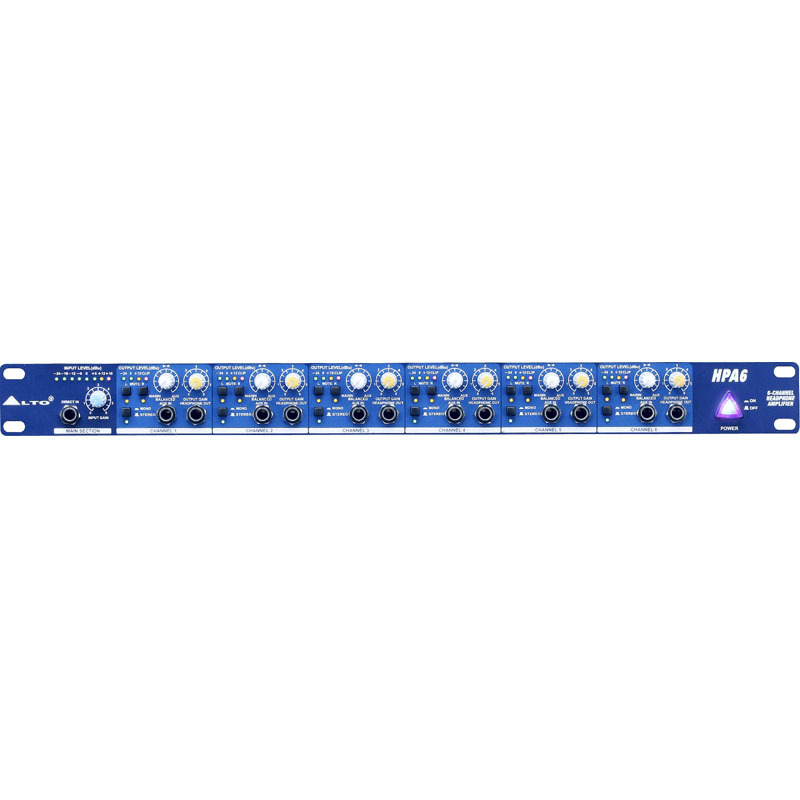 HPA6's front-facing stereo 1/4" Aux inputson each channel let you mix in any instrument or sound source, such as a clicktrack or loop software. If you've ever had musicians complain about not being ableto hear themselves—this is your solution. Each Aux input has a blend knobdirectly above, allowing you to create a custom blend between the musician'sinstrument and the rest of the mix that only that individual musician willhear. Each channel also features a four-LED output meter so you can view levelsquickly. Run each channel in Stereo or Mono modes. In Mono mode, Left and RightMute switches enable you to create additional mixes. Mackie Thump12 12-Inch Powered LoudspeakerOverviewOnly the Mackie Thump12 1000W 12 Powered Loudspeaker delivers the class-leading, chest-thumping low end you deserve. With 1000W of power, the Thump12 provides the high output you need in a package thats tough, lightweight and portable. Designed by th..
Roland CUBE STREET EX GUITAR AMPLIFIERSDengan ukuran yang compact dan pengoperasian yang menggunakan tenaga baterai, CUBE Street keluaran Roland ini merupakan amplifier yang paling terkenal dikalangan musisi yang sering berpergian. Saat ini CUBE Street EX terbaru menanamkan mobile amp yang sedang po..
Subwoofer Aktif Turbosound Milan M18BMilan M18 adalah subwoofer aktif yang dirancang untuk ekstensi bass maksimum. Input discrete dilengkapi dengan konektor jack XLR yang seimbang dan kontrol bersamaan membuat ideal untuk berbagai jenis musik, mulai dari konsul mixing, mikropon dan alat musik.Teknol..
Yamaha A15W 15" SubwooferThe A15W Subwoofer is the perfect piece to make your A Series system complete. Features a 15" woofer, recessed side handles, black carpet covering, and both a Speakon and 1/4" input connector.FeaturesBass reflex, front ported cabRecessed handlesBlack carpet covering15" woofe..